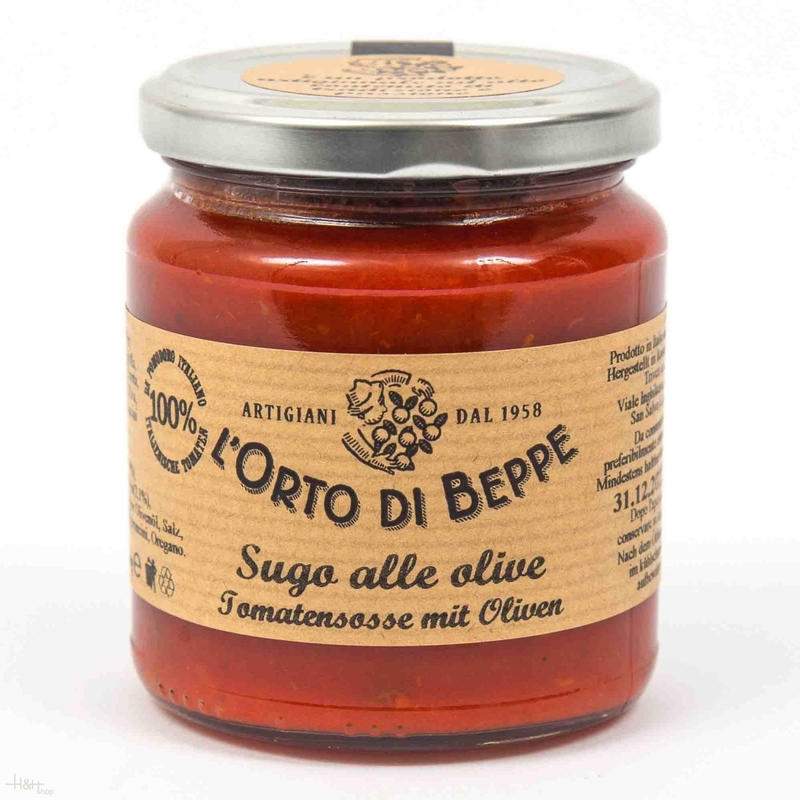 Sugo alle Olive - L'Orto di Beppe, 100 % italian tomatoes. The finely sliced truffles (Carpaccio) are perfect with thin slices of beef cooked in lemon and as dressing for fried eggs, as well as being excellent with boiled or baked fish. Aglio, Olio & Peperoncino 156 ml. - L'Orto di Beppe 6,25 EUR / 4,01 €/100 ml. Tomato Sauce with Basil 314 ml. - L'Orto di Beppe 4,70 EUR / 1,50 €/100 ml. Tomato Sauce 'Arrabbiata' 314 ml. - L'Orto di Beppe 3,75 EUR / 1,19 €/100 ml. Spicy Chili Peppers 156 ml. - L'Orto di Beppe 6,75 EUR / 4,33 €/100 ml. Tomato Sauce with Mushrooms 314 ml. - L'Orto di Beppe 3,50 EUR / 1,11 €/100 ml. Ragout with Bacon Speck 212 ml. - Mariolino Sughi 8,60 EUR / 4,06 €/100 ml. Wild Boar Ragout 212 ml. - Mariolino Sughi 8,60 EUR / 4,06 €/100 ml. Tomato Sauce with Aubergines 314 ml. - L'Orto di Beppe 3,50 EUR / 1,11 €/100 ml. Tomato sauce with cherry tomatoes ed basil 250 ml. - L'albero dei golosi 3,70 EUR / 1,48 €/100 ml. Tomato Sauce of 100 % Sicilian Cherry tomatoes 330 gr. - Ferrera 2,15 EUR / 0,65 €/100 gr.